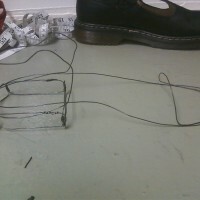 The next part of the shoe project was to make a wire replica of our shoe. 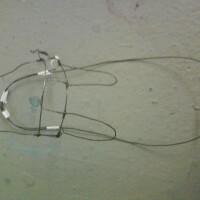 A large part of my process for this project was figuring out the material and tools. 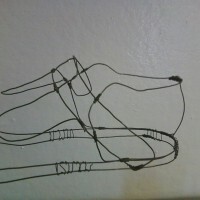 Wire and pliers were not something I’ve worked with before so experimenting with the wire constituted a large part of my time making the replica. 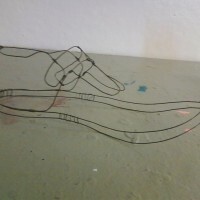 I ended up throwing out some of the pieces I made that I thought were well crafted after a few days of working with the material. 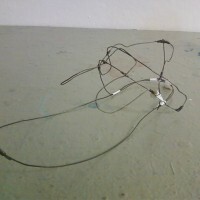 Here are some of the first pieces I made out of the wire. 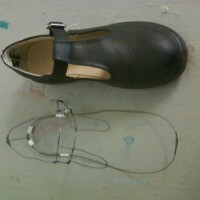 Of the pieces below, only two (the back panel and outline of the bottom of the shoe) ended up being used. 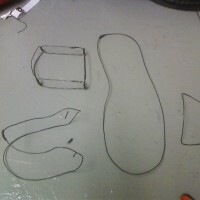 Even though I had to throw away the pieces I had spent so much time making, it was important to make them because it helped me better understand those parts of the shoe as well as how to use the wire to make those shapes. 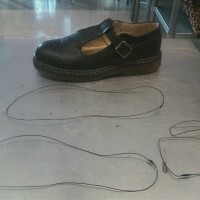 Finished heel (eventually discarded) and back panel finished. 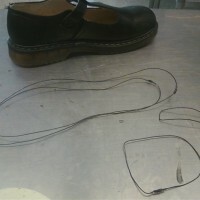 At this point, the pieces of wire are beginning to come together to look more like a shoe, as I had added the strap, eyelets, and in the last two images, a partial heel, although I hadn’t yet figured out how make the heel more believable.